Stress is a natural part of most jobs — a little stress can motivate us to finish projects on time and come up with new ideas, but when the pressure becomes too great, it can take a serious toll on workers’ health. Good news, though. You don’t need to pop a Xanax to escape the anxiety from your job. The answer is far more simple — just get a little more organized. Researchers at the Princeton University Neuroscience Institute found that the more cluttered a person’s desk was, the less they were able to focus at work, which caused participants to feel the heat when it came time to perform on the job. Become more efficient — and way more zen — by giving your office a healthy makeover. 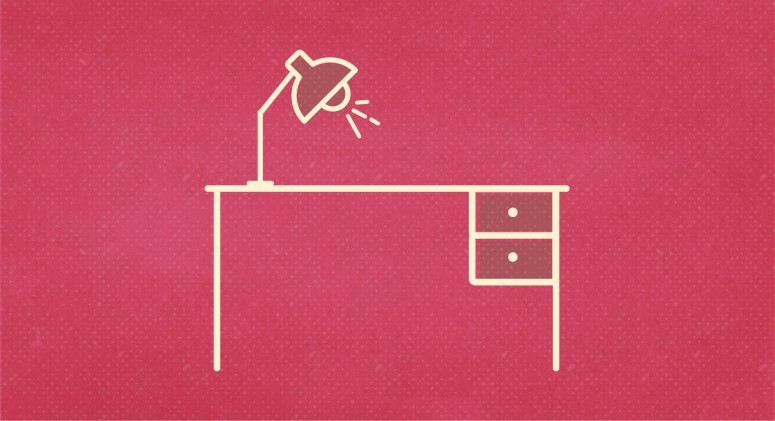 Best thing you can start with to declutter and de-stress your workspace? A clean desk. Most office workers spend seven to ten hours at work, with one in five even eating lunch at their desk. That means the average surface sees a lot of coughs, sneezes, coffee spills, and sandwich crumbs, making your workstation a breeding ground for bacteria. Exchange your sick days for a few more vacation days by keeping a germ-free work surface. Use a naturally antibacterial wipe to clean off your workspace if you don’t have time to step out for lunch, and at the end of every day. If you’re feeling blocked and uninspired at work, rethink your workspace. By using feng shui at your desk, the Chinese practice of organizing objects for better energy flow in space, you can revitalize your office and increase productivity. Start by dividing the desktop into nine sections, starting in the top left corner and moving from left to right. Depending on what each area represents, organize and place items in their ideal place. According to feng shui tradition, if you’re single and interested in meeting someone, a single flower in the top right hand corner of your space can help spark romance. Want to boost your creativity? Place a blank sketchbook or notebook for new ideas on the right hand side of the desk — this area is directly related to inspiration and creativity! In the 1970s, when designers and builders realized that they could cut energy and building costs by eliminating outside air ventilation, office workers started complaining of rashes, itchy eyes, allergies, and all sorts of illnesses. Because fresh air was no longer being pumped into offices, indoor pollution became a huge issue. It was enough of a problem that NASA researched some of the easiest ways to reduce indoor pollution — and they examined the effects of houseplants on air quality. Their top picks? Aloe vera, which helps filter formaldehyde and benzene found in many industrial cleaning products , and the peace lily, which rids the air of even the most volatile organic compounds. Both are relatively easy to take care of — even in low light situations — and can help even the dingiest office space feel brighter and more clear. We can all agree that those fluorescent overheads aren’t the most flattering light source, but vanity may not be the only reason you should request a new lighting option. Researchers studied the effects of lighting temperatures (cool versus warm) on men and women working in an office. Turns out that if you don’t like cool, white light, your long-term memory and problem-solving skills decrease dramatically when you’re exposed to it. But if you’re not a fan of fluorescent lights, typically there aren’t a lot of feasible options for changing up your lighting source: Incandescent bulbs have been phased out of production due to their negative effect on the environment, and not everyone has the option to build a skylight. Instead, try a salt lamp. Not only are they beautiful and an excellent way to create ambiance, but proponents of salt lamps also credit them for clearing the air of toxins and improving mood. Whether your cubicle mate indulged in a stinky tuna sandwich for lunch or you’re just having a difficult time focusing, essential oils can be a lifesaver at work. Proven to affect mood and cognitive response in adults, different essential oils can have serious effects on productivity and positivity in the workplace. If you need a moment to refocus, consider trying a few drops of rosemary oil on a cotton ball — it can help memory retention, stave off headaches and mental fatigue, and even act as a mid-afternoon pick-me-up. Other beneficial essential oils that can help reinvigorate the entire office? Lemon, peppermint, and grapefruit. For a more calming effect, try lavender or ylang ylang. Originally published at thrivemarket.com on November 11, 2015.